Jade Butterfly is a 5 reel and 1024 paylines video slot, powered by one of the best software provider – Pragmatic Play. Video slot have a very beautiful and calm theme, which takes its inspiration from Asian culture. 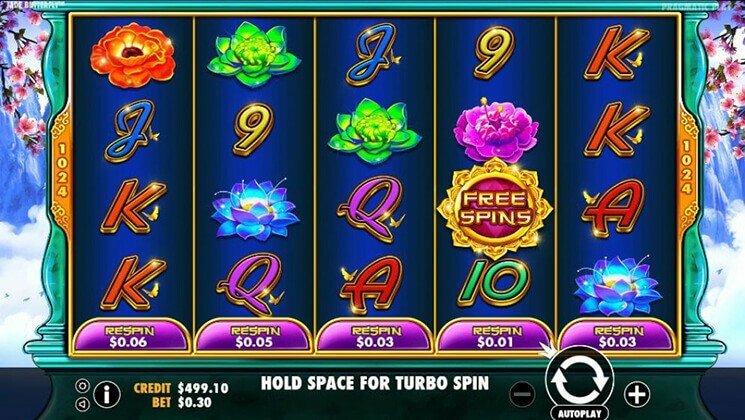 Visually design of the slot is very colorful, with superb high quality graphics. Low value symbols are appropriately themed playing cards which ranges from 9’s to A’s. High premium symbols are 5 different value flowers, where Golden Flower is most valuable symbol. In addition, game also have Wild and Scatter symbols as well. Before investing real money players can try Jade Butterfly Slot for free, or visit any Pragmatic Play casino such as: Mr.Bet Casino, BetChain Casino, Crazy Fortune Casino and others to play with real money and win. Rate to player rate is 96.47%. Before you start you quest, your wager need to be placed. You can adjust settings and sound volume with small buttons in the lower left corner. With “+/-” buttons you can set value of coins per line which ranges from 0.01 to 0.50. When you click “Autoplay” player can adjust number of spins that will go without stopping. Big button with two arrows is a “Spin”. When you land Scatter symbols on the 3rd, 4th and 5th reels at the same time you will activate Free Spins feature. When the feature is triggered you will receive 13 Free Spins and in addition you will get payout equals 2, 10 or 100 times of your stake. Also all the winnings during Free Spins feature will be multiplied by x3. Feature can be re-activated during Free Spins. After each successful spin during main game, you will have the option to activate Individual Reel Respin feature. You can choose which reel to re-spin and under the each reel you will see how much re-spin will cost.